Missing features including auto-dimming IRVM, front parking sensors, dual-zone climate control, auto-wipers, lumbar adjustment, etc. Fortuner is available in 6 different colors - Super White, Grey Mica Metallic, Pearl White, Attitude Black, Silky Gold Mica Metallic and Bronze Mica Metallic. Toyota Fortuner ? who needs a road? Toyota Fortuner has been the undisputed leader in the SUV category despite falling in the high price range. The most sought after SUV with its stylish design and powerful engines has managed to grab the pole position in the segment and has been maintaining the lead over the rivals. Toyota launched the first generation model of Fortuner in the year 2009 and it soon became an instant hit in the Indian car market. One of the primary reasons to launch the car was to counter the likes of Ford Endeavour and it did the job for the brand quite brilliantly. However, as the time passed, its age started to show up and the vehicle desperately needed a facelift as the 10-year old engineering, design, and styling required important amendments. So finally in the year-end of 2016, Toyota introduced the second-generation Fortuner in the market with all new-platform to regain its lost ground. In terms of exterior styling, the new Toyota Fortuner is big and bold, thanks to the underpinnings of the Hilux pickup truck. The second-gen vehicle features the tough body frame construction and uses the same TNGA platform that underpins Crysta as well. On the dimension front, Fortuner measures 1,855 mm in width, 4,795 mm in length and 1,835 mm in height. So, the revised dimensions make the SUV wider and longer as compared to its predecessor. The front face of the vehicle gets a small radiator grille and slimmer wraparound headlights. The car now gets self-leveling bi-beam LED projector headlamps, LED DRLs and a bonnet with no air scoop and more chrome work. The new Toyota Fortuner 2WD sports 17-inch while the 4WD version rides on the 18-inch alloy wheels. Fortuner is offered in different colours such as Super White, Attitude Black, Phantom Brown, Grey Metallic, Silver Metallic, Avant-Grade Bronze and White pearl Crystal Shine. Talking about the interiors, Toyota Fortuner gets all-black colour scheme that lends a plush look to the car. The dashboard design is all new which gets the modern touch while the center console features a new touchscreen system that supports Bluetooth, USB and Aux-In connectivity. The car is loaded up to the brim with features including 8-way driver power seat, park assist, cooled upper glovebox, cruise control, automatic climate control with auto rear cooler, multi-functional steering wheel, and second row with 60:40 split option. Toyota Fortuner is offered with two engine options: 2.7L petrol and 2.8L diesel, both shared from the Innova Crysta. The petrol mill can generate the power output of 166PS and peak torque of 245Nm, mated to either 5-speed manual or 6-speed automatic transmission and is only available with 2WD option. The diesel engine can churn the power of 177PS and is capable of producing 420Nm of peak torque in manual and 450Nm in the automatic version. The engine is paired with 6-speed manual or 6-speed automatic gearbox with 2WD and 4WD options to choose from. As far as safety is concerned, Toyota Fortuner comes equipped with 7 SRS airbags, ABS with EBD, Vehicle Stability control, Brake Assist and Hill Assist control. Other aspects include speed auto lock with emergency unlock, pedestrian protection support, Downhill assist control and ISOFIX – tether anchor on the second row. The price of the new Toyota Fortuner is divided according to the 2WD and 4WD variant. Taking a glance at the pricing details, Toyota Fortuner base model 2.7 2WD MT is priced at Rs. 26.69 lakh while the 2.8 2WD MT is available at the price tag of Rs. 28.29 lakh. It's top-selling 2.8 2WD AT is tagged at Rs. 30.61 lakh while the 2.8 4WD is priced at Rs. 30.72 lakh. Its top-spec variant 2.8 4WD AT is available at the price tag of Rs. 32.48 lakh, ex-showroom, New Delhi. Toyota Fortuner retains its old-school SUV traits with improved equipment list. With the latest technological advancement, the car makes a solid case against Ford Endeavour, Mitsubishi Pajero Sport, Skoda Kodiaq, and Isuzu MUX in the segment. People who have owned earlier Fortuner would perhaps, cursed the maker as despite spending so much on a luxury SUV, the interiors were the same as that of Innova. However, this time around, the story is a bit different and not a copy paste job. The dashboard design is unique and the sense of luxury is also enhanced. It’s now more upmarket and well equipped than the earlier one. The center console is well-defined while the crispy instrument panel and the steering wheel design also uplift the ambiance inside. The extensive use of leather and chrome across the cabin shows the opulent approach of the Japanese carmaker. The carmaker has used soft-touch materials such as faux-leather on the door armrest, cooled glove box and the velvety material on the sun visors. All this looks attractive but the built-quality is not up to the mark. The multi-information display consists of a large TFT screen with sharp looking Optitron Cool-Blue Combimeter and chrome highlights. The illumination can be controlled which is a nice feature. The instrument panel gives a whole lot of information including real-time average and fuel economy, outside temperature, average speed and distance to empty. Coming to the seats, the new leather draped seats are much comfortable and well bolstered offering nice shoulder, back and thigh support. The second row offers more knee room and even the backrest can nicely hold the upper back, making the journey comfortable. The third row is also improved however, it will be still tight for tall passengers. The dedicated air cons on the roof is icing on the cake, however, for a 7-seater luxury SUV, one USB slot is certainly not enough. Flipping the third row can reveal huge space, enough for longer trips. Further, the newly added 7-inch touchscreen infotainment in the top spec model adds more to the appeal. The infotainment is compatible with Bluetooth, USB, Aux-In and also allows connectivity to navigation and DVD playback. The duty of audio output lies on 6-speakers. The lack of sunroof will surely irk some buyers, however, the car is loaded with other comfort features such as cooled upper glovebox, 8-way adjustable driver seat, back door smart key access among others. In terms of looks, the new Fortuner stands out and it’s a complete departure from the older version. You place both the cars side by side and it will be hard to believe these cars come from the same clan. The Fortuner has grown bigger in proportions as it is 90mm lengthier and 15mm wider from the predecessor and while it is 15 shorter in height, it hasn’t reduced its road presence. The car is built upon ladder frame construction shared with Hilux pick-up truck which lends it a bulky and aggressive look. The appearance is jaunty from all the angles with plenty of futuristic elements incorporated to its sides. The front façade comprises of high bumper line with slim LED headlights along with LED daytime running lamps. To give it an upmarket feeling, plenty of chrome has been used on the grille, around the fog lights, and in the headlights. The chrome treatment is carried over to the sides with a thin strip underlining the window line adding dynamism to the candid silhouette. The muscle of the SUV can be accurately observed from the sides. This comes from the flared wheel arches, huge 17/18 inch wheels and details such as black cladding and bold sidestep. Clearly, the design seems to be on-going at the rear with the chrome strips wrapping around the D-pillar. When viewed from the back, the height is obvious with high-placed windscreen and wraparound LED tail lights. The rear bumper houses a set of rear parking sensors along with a couple of reflectors as well. The spare tyre is nicely tucked under the bumper while the thick chrome embossed ‘FORTUNER’ on the boot lid will tell you the name of the car you are following. When it comes to fuel economy, you can’t expect much from big SUVs like Fortuner. However, the carmaker has tuned the engine to provide maximum fuel economy. The diesel-powered Fortuner of course is the fuel-efficient one returning ARAI certified mileage of 15.04kmpl in the automatic 4WD variant and 14.24kmpl in manual 4WD version. On the flipside, the petrol automatic 2WD reads 10.26kmpl, the manual 2WD can deliver 10kmpl. Real world mileage will definitely be different. The new Fortuner gets double wishbone suspension at front and four-link solid-axle at the rear. In terms of ride quality, the newer one is definitely better and the car feels livelier. On the move, the straight line stability is commendable and this makes the car composing at high speeds. The uneven and bad section is where the real strength of this car lies. The SUV just glides over large craters like a breeze. The new Fortuner comes with tweaked engines. The 2.8L 4-cylinder turbocharged intercooled diesel motor is smaller in displacement compared to the older 3.0L, however, it produces more power 177PS and 450Nm(AT)/420(MT) of torque. This is the same engine which powers the new Innova Crysta. The powertrain is paired to either 6-speed automatic or 6-speed manual transmission. While there is ample amount of low-end torque, the turbo-lag is also minimal. The engine is very much drivable in and around the town even at higher gears at low rpm. The diesel one also comes with the option of 4WD for the off-roading enthusiasts. The 2.7L 4-cylinder in-line petrol engine is also derived from the Innova Crysta, pumping out 166PS and 245Nm of max torque. This one too gets the convenience of manual (5-speed) or automatic (6-speed) gearbox options. Petrol engines are known for providing luxury and this one does the same. The engine is quite smooth and refined and sitting inside the cabin make you feel relaxed. Even at moderate speeds, there isn’t any dearth of refinement. Fortuner also offers user-selectable Eco and Power driving modes, each tuned for different driving preferences. As the name suggests, the ECO mode offers less power delivery and dull throttle while giving you improved fuel economy. However, it’s not sluggish and there is enough grunt on tap. The Power mode gives sharp throttle and the engine is also very responsive with improved acceleration time. The braking in the new Fortuner has been greatly improved over the earlier model. The car finally gets all-round disc brakes and the braking power has been enhanced. Even putting the car to hard braking from 100kmph is very powerful and it comes to standstill without any trouble. However, one must keep in mind that SUV weighs 2-ton, so it’s better to maintain a huge gap from the vehicle in front. Now coming to the safety department, the off-roader is loaded with 7-SRS airbags, ABS with EBD, brake assist, traction control, vehicle stability control, hill, and downhill assist control. And the most filling factor is that the car has scored 5-star in ANCAP and Latin NCAP crash tests. Other important safety aspects include ISOFIX + Tether Anchor on the 2nd row, speed auto lock with emergency unlock and impact absorbing structure with pedestrian protection support. So, it is sufficient to say that Toyota has covered the passengers from all area. 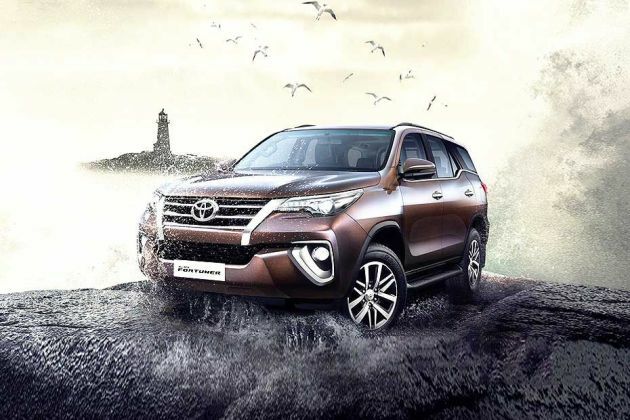 What is the price of Toyota Fortuner? On road prices of Toyota Fortuner in New Delhi starts from ₹ 30.12 Lakh for base variant 2.8 2WD AT, while the top spec variant 2.7 2WD AT costs at ₹ 27.89 Lakh. What are the colors options available in Toyota Fortuner?